Tacoma Click! funding legal action against the City of Tacoma re: billboards? But the campaign has rankled several council members, some of whom say they were surprised to learn about Click’s contract with Clear Channel only this month. by NineInchNachos on 5/29/2012 @ 1:56am least favorite thing about CLICK! by fredo on 5/29/2012 @ 5:30am According to the Tribune, the city council is just learning about these Click sponsored billboards . 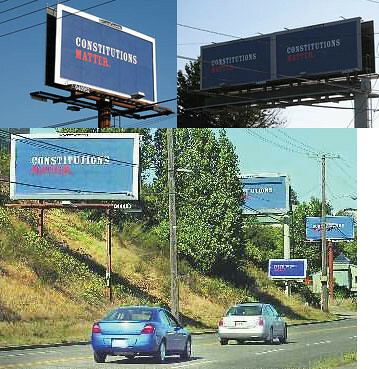 How can you be on the Tacoma City Council and not notice these billboards? They've been up there for years. And if they read the local blogs such as this, people have been complaining about the use of tax dollars to purchase this sort of advertising. I'm with RR, the Click billboards are my least favorite thing about Click. by CaptainBritton on 5/29/2012 @ 6:58am I'm disappointed to say the least...I see here that they bought $90K worth of Billboards/ad space....CLICK? You just failed, big time. by KevinFreitas on 5/29/2012 @ 6:59am Thanks for posting this Erik. It's absolutely unreasonable to see a City entity like Click! advertise on Clear Channel billboards throughout Tacoma. Though not all billboards they advertise on are non-confirming it makes sense for them to be pulled entirely (and instead pay for local ads on sites like FeedTacoma or the side of local busses like Pierce Transit) so this conflict of interest no longer stands. Ditto goes for Metro Parks and their frequent local billboards for Northwest Trek and the Point Defiance Zoo! Oh, and we all recall the City actually owns land upon which about 20 billboards sit, correct? Yeah, those need to be forcibly removed by the City immediately as well. In the meantime, report the slightest blight with any billboard using this handy dandy form I made. Death by a thousand cuts to Clear Channel in Tacoma, I say! Kevin, the advertising on the side of the buses is sold through Clear Channel so that would continue to provide city money to Clear Channel. by Jake on 5/29/2012 @ 7:13am Fredo, Unless something has changed recently the bus advertising is through Titan. good catch Jake, they don't sell wrap-style advertising on the bus system but only on the trains. My mistake. by KevinFreitas on 5/29/2012 @ 7:31am I believe Sound Transit utilizes Clear Channel (from my questions re: Link ads a few years ago). by Jesse on 5/29/2012 @ 7:49am What a joke it is to have Click! advertising on illegal Clear Channel billboards. It makes the city of Tacoma look completely incompetent. I bet the people over at Clear Channel get a good chuckle out of this. by NineInchNachos on 5/29/2012 @ 8:37am bloody disgusting. I declare Tacomic Jihad on these billboards. by The Jinxmedic on 5/29/2012 @ 8:37am Bwahahahaha! At this point, we're definitely moving to Argentina. (But first, Tango lessons.) Hmmm... I wonder if the crows can speak Castillian? by Erik on 5/29/2012 @ 10:31am It is one thing to see government waste public funds. It is another to see our own public utility thwart the public will and make Tacoma taxpayers pay for both sides of a lawsuit. Click! 's actions are harmful to Tacoma's effort to clean up blight in the city and may actually harm the City of Tacoma's effort in court by leasing out non-conforming billboards. by tacoma_1 on 5/29/2012 @ 10:34am Click obviously doesn't understand their audience. Advertising doesn't work if all it does is piss off the receiver of the message. I don't use Click, but anyone that does should send an email to them asking them to stop using these billboards or you will switch cable providers. by NineInchNachos on 5/29/2012 @ 10:43am Day of RAGE!!! My name is Kevin Freitas and I'm a long-time customer of your internet service and former customer of your cable TV. As a current customer I would like to see a great local choice for these services cease advertising on Clear Channel billboards. Given that Click is a municipal service there is a clear conflict of interest related to the City of Tacoma's current and ongoing litigation with Clear Channel. There are numerous alternate options for local advertising that don't involve giving money to Clear Channel (e.g. Pierce Transit busses, local websites like FeedTacoma.com, Google AdWords, Facebook ads, etc) and, again as a customer, would like to see funds diverted away from Clear Channel advertising. For many Tacomans, big billboards are anathema, a blight on the city. At packed meetings, residents pleaded with city officials to continue fighting the major billboard company, Clear Channel Outdoor, which wants to replace its static signs with digital ones that change the message on a regular basis....Click has done other forms of advertising but decided that billboards would be more effective. Even if that is true, and could be measured in some way, that decision doesn’t take into account residents’ antipathy to billboards, especially the large nonconforming ones. Just because Click can advertise on billboards doesn’t mean it should. by Erik on 5/30/2012 @ 1:05am Check out this cartoon on Click!